We are Grace In Action Church. A vibrant community of Faith, based in the Radical Love of Jesus Christ. We are creating authentic community, being transformed by God and one another, and building a more just society for all of God’s people. Sunday Services with liturgy and conversation every Sunday at 1:00 P.M. at Grace in Action, 1725 Lawndale Street. Contact Pastor John for more details. Stitching up Detroit Youth Collective Mondays 4-6 at the Grace in Action, 1725 Lawndale Street. Contact David Camarena for more information. Classes de Guitarra para los jovenes cada lunes a las 6:30 en 1725 Lawndale Street. 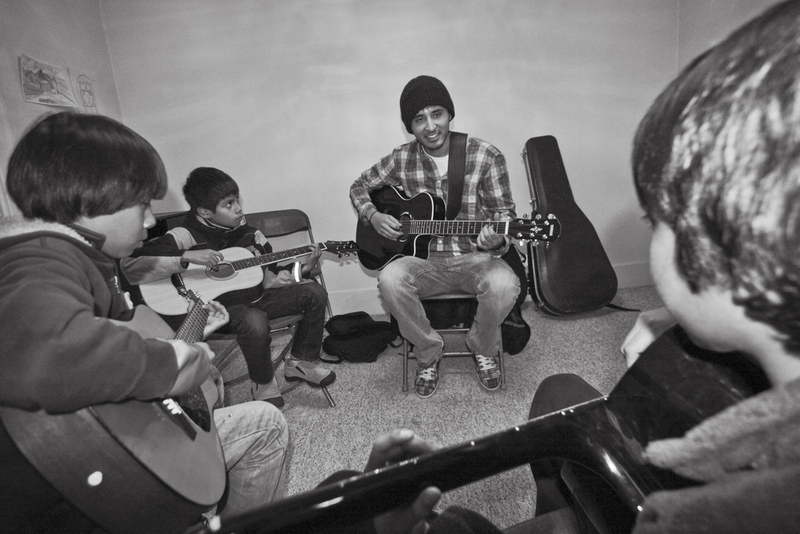 Guitar Classes for youth each Mondays at 6:30 @ 1725 Lawndale Street. Contact Pastor John for more details. Breakdancing classes with the Motor City Street Dance Academy (MCSDA) Wednesdays 6:30-7:30PM @ 1725 Lawndale St. Contact Pastor John for more information. Photo Collage Project for youth Wednesdays 4:30PM @ Grace in Action. Contact Anahli Vazquez for more information. Data security, privacy and digital literacy classes through the Equitable Internet Initiative team. Contact Nyasia Valdez for more info. Radical Productions Youth Collective Tuesdays and Wednesdays 4-6 at 1725 Lawndale. Contact Sean Cote for more details. Coding classes Thursdays at Grace in Action. Contact Sean Cote for more details. Noche Familar cada trecera 4th Thursday of every month a las 6 en 1725 Lawndale. For more information about Grace in Action Collectives visit their webpage.